Juju Jacobs, an organizer with Organization for Black Struggle, prepares to send volunteers out to canvass neighborhoods urging residents to vote in Ferguson, Missouri. Ferguson’s municipal elections Tuesday showed that civil unrest can spark democratic action. Turnout was up in each of the city’s three wards, from which City Council members are elected, and two African-Americans won, making the council half white and half black for the first time. But turnout in Michael Brown’s home ward still lags significantly behind the two other wards in the city. Brown, who was fatally shot by a police officer in August, was from Ward 3 — each ward elects two council members, but in staggered elections. 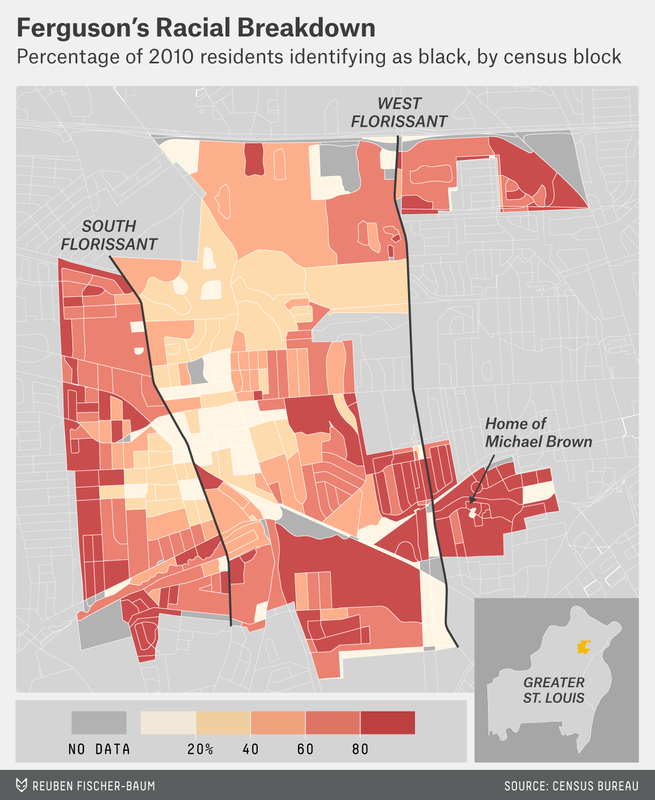 Ward 3 is also home to the poorest corner of Ferguson. And it is where the majority of African-Americans in Ferguson live and where the majority of the protests that followed Brown’s death took place. But you can cut the numbers several ways. Ward 3 turnout increased the most, but that’s partly because it had the most room for improvement. Ward 3 turnout still trails well behind the other two wards. Wards 1 and 2 each saw turnout of 32 percent of registered voters, which is 1.7 times the turnout in Ward 3. In terms of raw vote increases, turnout in both Wards 1 and 2 was up more than 1,000 voters from the average of the past four elections. That’s a little less than double the increase in Ward 3. Moreover, Wesley Bell, the winning candidate in Ward 3, was not the candidate supported by the most vocal protesters after Brown’s death. Bell actually was endorsed by current members of the City Council. In Ward 2, a former mayor (who is white) won over a candidate closely aligned with the protesters. Now, we shouldn’t make too much of ward-level results. Until we get figures at the precinct and voter file level, we won’t be able to be sure which racial and economic groups were spurred to turn out after the Ferguson protests. Still, it seems on first glance that turnout among black voters, and especially poorer black voters, still lags behind their wealthier and white counterparts. Calculated by the number of votes cast for the two candidates on the ballot for City Council from Ward 3 divided by the number of registered voters as of 2013, the last time City Council elections were held. We don’t have data on registered voters in 2015, although that number likely differs only slightly from 2013. We couldn’t calculate percentage increase in terms of the adult population because the census tracts do not track perfectly with the wards. And neither the Ferguson city clerk nor the St. Louis County Board of Elections keeps track of the population by wards.